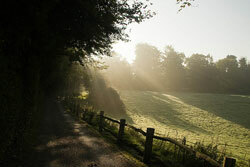 You’ll run through the lovely undulating, wooded landscapes of Limpsfield Common and the High Chart of Surrey and Kent. Here’s some more info about these two areas. 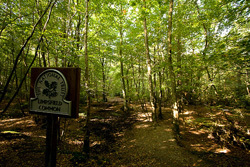 Largely owned by the National Trust, Limpsfield Common lies on the Greensand Ridge, a high sandstone ridge that runs west to east through Surrey and Kent separating the chalk escarpment of the North Downs from the hills and vales of the Weald. This densely wooded hill country is criss-crossed by paths and horse-rides that make it popular with walkers, horseriders and mountain bikers. It is also crossed by the 2000-year-old Roman trunk road that connected Londinium to Lewes and the south coast. There are magnificent beech trees, some about 200 years old, carpets of bluebells in the spring and lovely autumnal colours in October, when our race takes place. From at least the 14th-century commoners grazed their animals here and collected stone and firewood. This grazing prevented the spread of scrub and trees and maintained the common as open heathland. But after the decline of commoning in the early 20th century woodland took over, leaving just a few residual patches of heath. The National Trust is trying to preserve these open areas to encourage rare heathland wildlife to return. Stone was quarried on Limpsfield Common as far back as Domesday times (1086) and ceramic ware was made in pottery kilns near Limpsfield Chart in the 12th to 14th centuries. Two kiln sites have been identified at Scearn Bank. Brick-Kiln Lane is named after a brick works located there in the 19th century. Major Baden-Powell (of Boy Scouts fame) and Colonel Samuel F Cody, the Wild West showman who claimed (falsely) to be the son of Buffalo Bill Cody, flew man-lifting kites from the common in the days when men were learning to fly. The High Chart adjoins Limpsfield Common and forms a large area of woodland which is actively enjoyed by dog walkers, ramblers and nature enthusiasts alike. The woodlands consist mainly of evergreens and conifers, including Corsican Pine, Western Hemlock, firs and large areas of heather bracken and birch. 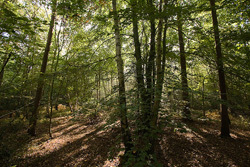 The woodland lies at the southernmost point of the Titsey Estate, one of the largest surviving historic estates in Surrey, dating back to 1534 when it was bought by Sir John Gresham, of the famous London merchant dynasty. A significant amount of the run takes place over land south-east of Limpsfield owned by the Titsey Estate, hence the name of our race. The word “chart” comes from the Old English chert meaning rough ground. In this high wooded area of the Greensand Ridge there are a number of place-names incorporating the word, including Chartwell, the former home of Winston Churchill, a short run east of here.